“I was obsessed with the story,” Annie Leibovitz says about a photograph of her parents at the first-ever MCA Women’s Board Luncheon in celebration of the Museum of Contemporary Art’s 50th anniversary. The event was dedicated to honoring extraordinary women artists around the world and uniting Chicago’s most influential leaders in support of arts education and public outreach programs. The MCA Women’s Board was founded in 1967 and has worked to created dynamic programs and projects connecting the museum to its community. Proceeds from the Visionary: Celebrating Annie Leibovitz luncheon support the Women’s Board Learning Studios and the museum’s work with schools, teachers, and teens. Considered a living legend, Leibovitz began her career in the 1970s shooting for Rolling Stone magazine and continued to hone her distinct portraiture gaining credits in other large editorial outlets, such as Vanity Fair and Vogue. 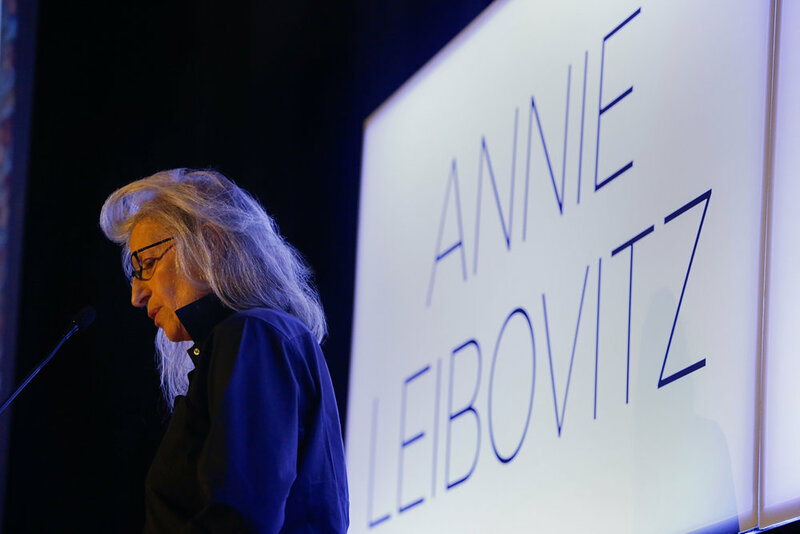 The afternoon was spent with the keynote presentation of Leibovitz telling anecdotes, providing insight to her work and showing a selection of images from her latest book Annie Leibovitz 2005-2016. Her insights as to the past two decades in career are marked with historical and cultural figures such as President Barack Obama, Lin-Manuel Miranda and Rihanna. Leibovitz is a household name partly by her work with famous individuals, but it is her faithful motive to story that gives depth and range to her images, not just of major names, but to also strangers, family and close friends. She makes a point amid her slideshow presentation that “it is not the photographer’s job to make the subject comfortable”. This is extremely poignant and each photographer is unique in the way they interact with their subject. I believe Leibovitz was getting at the point that there is no one right way to create a portrait, but it comes down to trust between subject and photographer. It’s the photographers job to capture the image and convey meaning through it to the rest of the world. Leibovitz’s image of Pete Seeger in 2001 looking out across the water evokes a sense of wonder. Being able to capture feeling in a person’s expression or body language into something beautiful and meaningful is the photographer’s purpose. You can imagine this character in orange wading trousers, rolled up shirt sleeves with shoulder hung banjo is ready to tell you all about Croton-on-Hudson, NY, but if he was looking straight at camera in a deadpan manner you would not have the same reaction to that piece. This is part of the reason why photographers agonize over subtle head tilts, the faintest expression and other minute details because of how the message from the subject is being received and how that moment is presented to the viewer. Visual storytelling transcends language barriers and we are a society that thrives off of story. Press photographer Weegee (nee Arthur Fellig) illuminated the underbelly of New York City of the 1930’s and 1940’s with his signature style that depicted unflinching realistic scenes of urban life, crime, injury and death. While capturing reality in a non-altering way, Weegee was able to expose raw truths about the world around him. Photography and theater mirror each other in the way that controversial topics and stories being told in an honest and diverse manner. Iconic portrait photographer Robert Mapplethrope challenged societal norms by capturing subject-matters including homoeroticism with his large-scale high contrast pieces. Theater has explored controversial and “taboo” topics since its inception whether through tears or laughter or both. Molière’s Tartuffe was well received in 1664 and its challenge of hierarchy and power lead to a short lived censorship at the request of those religious and political, but is now considered among the greatest classical pieces. Years later, Henrick Ibsen’s A Doll’s House (1879) was considered radical for a complex heroine leaving her husband’s home and rejected role as wife and mother. Jean-Paul Satre’s existential No Exit (1944) also was widely praised for its examination of the human morality and was encouraged by The New Republic that “it should be seen whether you like it or not”. What does this mean for the future then? There is the classical slide show use of imagery in theater that is highly impactful and has been used in films for years often in based on true events stories. The blending together of mediums has an abundant examples the way the art world has been shifting and changing over the years. Countless artists have mix Medias, but if it had not been for visual artist Man Ray exploring the technical of photographic processing we would not know that camera-less photography was achievable and it would not have inspired Dadaist poets and Surrealist writers and painters. In today’s world it is more than obvious that art informs art. The close relationship artistic mediums have are intertwined and are blossoming. If looking at a venn diagram, one could argue that moving film is the commonality between photography and theater. This particular relationship across mediums showcases an exciting move towards new combinations and methods of conveying story. Cindy Sherman took style inspiration from film noirs and through a detailed control over environment and dramatic poignant light, she created her ironically ambiguous series “Untitled Film Stills”. Gregory Crewdson heavily incorporates the technical side of processes from movies and theater to create images. In an in-depth interview with Aperture Magazine, Crewdson discusses the multitude of steps that go into his creations are a production size scale to construct his tableaus of the eerie quietude of American homes and neighborhoods. With photography getting inspiration from film and theater, theater is bringing more and more stories from screen to stage with Broadway shows like Mean Girls and Anastasia. Sets are now not only wood and nails, but a projected scenic view or even abstracted non-linear point in time. Projections and graphics are being used as live interactive subjects contributing to theatrical experience. Gene Kelly’s post WWII France is projected actively hand sketched to life in the abstract romance An American In Paris (Broadway in Chicago) and dreamlike sequences illustrating President Lincoln’s nightmares in The Heavens Are Hung In Black by Shattered Globe Theatre shakes the very core of the audience’s soul into empathy at the 16th’s difficult choice in shaping our country. As if these examples were not impressive enough, Tony nominee Sven Ortel’s work on Hubbard Street Dance’s 2017 Fall Engagement took performance art to a new level with their spatial aware piece at Harris Theater. Backstage in front of a large semi-sheer scrim with swirling smoke created a new space for dancers to perform in a never-before-seen way. The eye is being used to create excitement. This has been known for years in marketing and even now theaters are utilizing promotional images and video spots in new imaginative ways across media channels, including social media. Visuals make us excited and make us think. Theorizing deeper meanings to life and influencing others to explore, examine and invent. Most of all visuals allow us to consider the relationships between ourselves, as well as between each other. When asked if there is a next big name on the horizon in the photo world to look out for, Leibovitz quickly responded that there’s no one individual that comes to mind as the next big thing, but that there is room for everyone. Photography and theater are just two prime examples of the visual arts excelling our need for story. The way the story is told is constantly shifting and changing, but I for one cannot wait to see how it unfolds. 4/11/18 Women’s Board Visionary Luncheon featuring Annie Leibovitz Photo Credit: Jeremy Lawson and Braxton Black for Jeremy Lawson Photography. Annie Leibovitz, 2012. Picture credit: © Annie Leibovitz. Annie Leibovitz: Portraits 2005–2016, by Annie Leibovitz with an essay by Alexandra Fuller. Published by Phaidon.